I once read of an artist who made nothing but sculptures of chairs. I can understand why - chairs have such personalities. 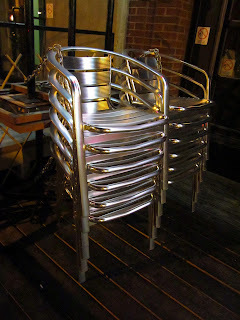 This evening, I noticed a lot of abandoned, lonely-looking chairs as I walked through the Market. This chair was all by itself in an empty space that used to be a grocery store and seems to be under renovation. 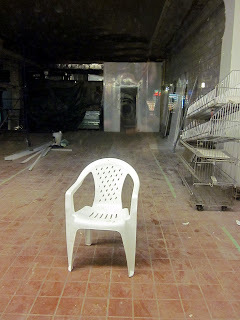 There was nothing in the space except junk and dust and this solitary chair, patiently facing the window. 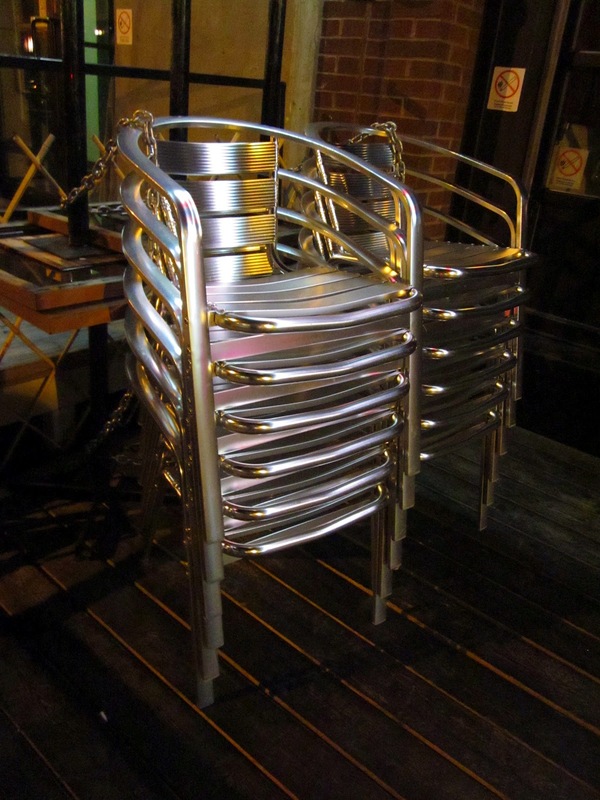 These chairs looked very sculptural indeed, all stacked up at the side of an outdoor patio, waiting to be placed near tables so that people could sit in them again. Put together like this, they looked like a giant segmented insect with a shiny metal carapace. This chair was the only one on the sidewalk in front of a yogurt dessert place. Until recently, there were nearly a dozen chairs clustered here, creating a space for people to sit and talk while they ate their yogurt. But now that the cooler weather has arrived, most of the chairs have been taken inside leaving this defiant-looking loner by itself. Oh well - at least it has an "OPEN" sign to keep it company! OK, only YOU could make empty chairs interesting!! An empty chair looks as if it is waiting for someone to sit in it. It's amazing that each of the chairs you photographed look like they have such different personalities! Great stuff! Help Wanted. But Would You Want to Work Here?